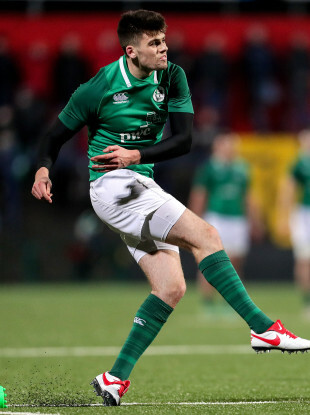 Ireland U20 out-half Harry Byrne. THE IRELAND U20 TEAM to take on Wales on Friday evening [KO 7.05pm, RTÉ 2] shows one change from the side that clinched the Six Nations title last weekend. Harry Byrne returns for the Grand Slam bid in Colwyn Bay, having missed out on the win over France in Cork due to injury. He replaces Ben Healy at out-half in Noel McNamara’s side. “It was great to win the title with last week’s win over France, but it’s testament to the players how they’ve parked the victory and are fully focused on what can be achieved in Wales this Friday night,” said McNamara. Victory at Parc Eirias will secure a first U20 Grand Slam for Ireland since 2007, when a team that included the likes of Keith Earls and Cian Healy achieved that feat by overcoming Italy on the final weekend of the championship. Email “Byrne returns at out-half for Ireland U20 side bidding for Grand Slam glory”. Feedback on “Byrne returns at out-half for Ireland U20 side bidding for Grand Slam glory”.